All the flavors of a warm cup of hot chocolate topped with marshmallows combined into one delicious hot cocoa sandwich cookies with marshmallow frosting! 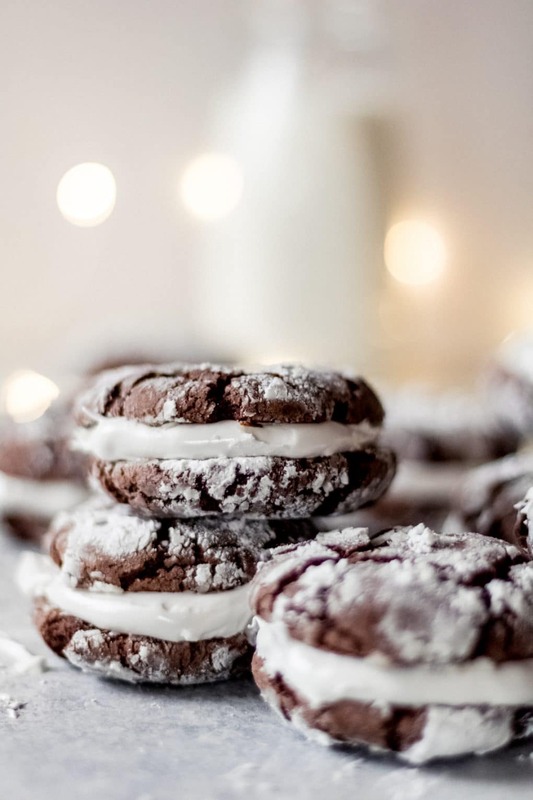 This is what happens when you combine a chocolate crinkle cookie and marshmallow frosting – you get hot cocoa sandwich cookies, and they should definitely be on your holiday cookie platter! 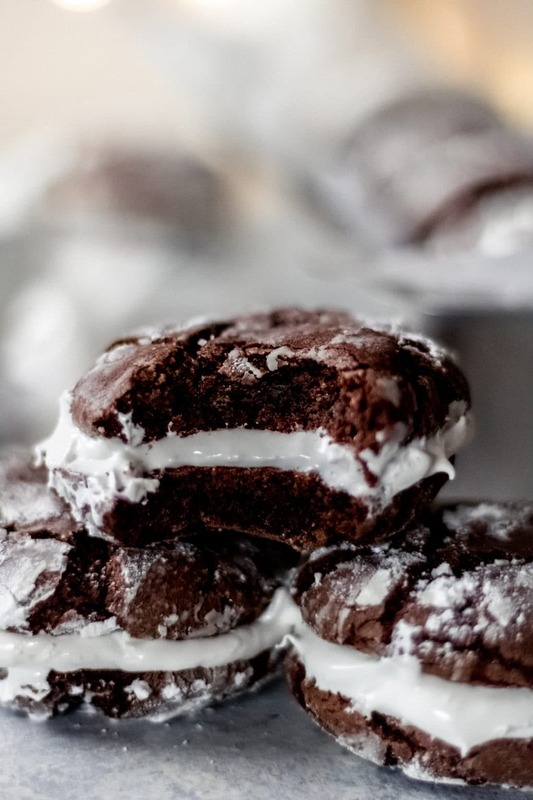 Fluffy marshmallow frosting smashed between two soft, chocolate crinkle cookies, pure bliss! What are hot cocoa cookies? Traditionally speaking, hot cocoa cookies are made with hot cocoa powder. However, my goal with these hot cocoa sandwich cookies was to bring out the flavor a warm, velvety cup of hot cocoa topped with gooey marshmallows. 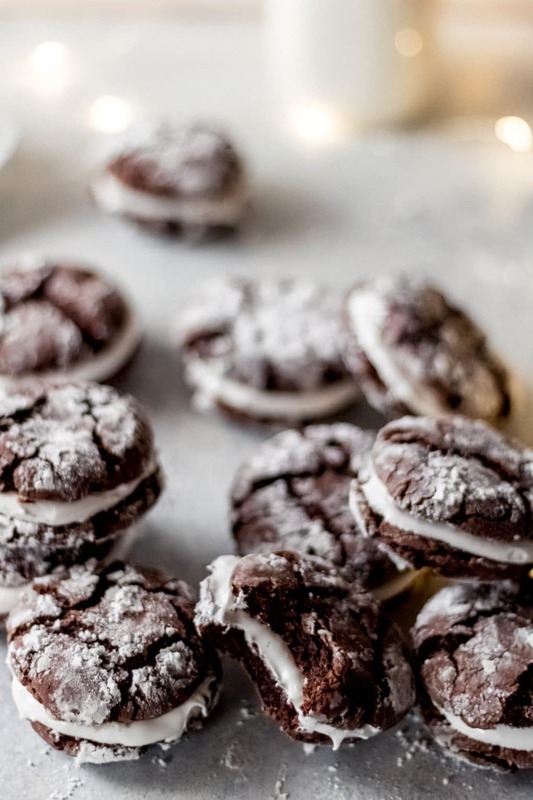 Chocolate crinkle cookies are ridiculously easy to make, so using them for these sandwich cookies was a no-brainer! How do you make marshmallow frosting? To answer your question, no, marshmallow frosting does not contain actual marshmallows. This marshmallow frosting is very similar to marshmallow fluff but smoother. How long do hot cocoa cookies last? The joy of crinkle cookies is that they tend to stay soft and fluffy. The marshmallow frosting is best when served immediately. I would suggest making these the day of, but no sooner than the day before serving. You can then store them in an air-tight container and use within a few days. 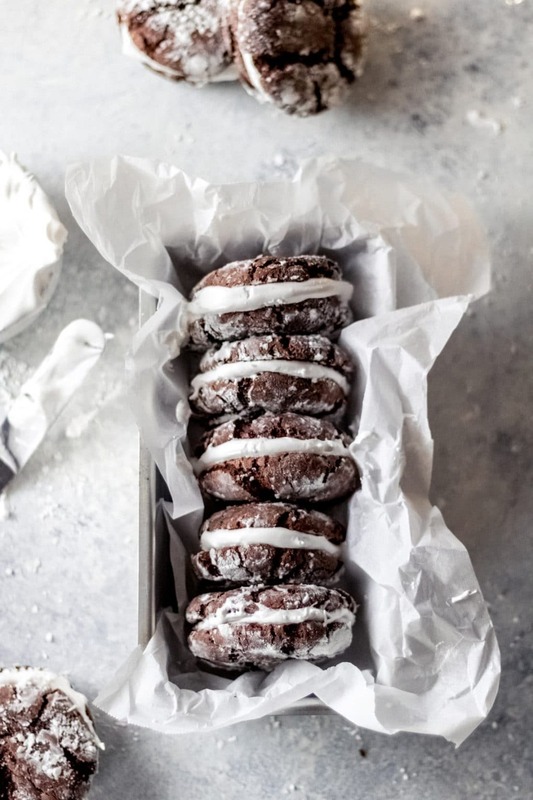 These hot cocoa sandwich cookies would be a hit at your holiday cookie exchange, and I’m sure Santa would enjoy them, too! 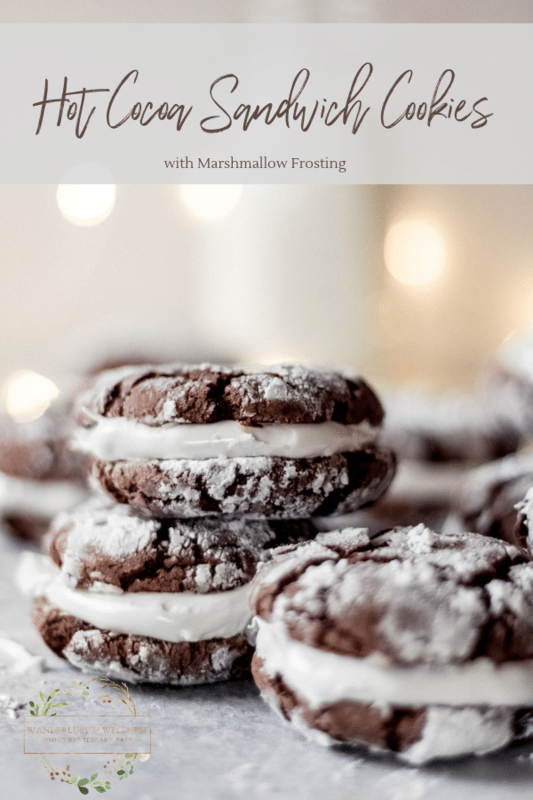 All of your favorite flavors of a warm cup of hot cocoa with marshmallows combined into a delicious hot cocoa sandwich cookie with marshmallow frosting. Add the Devil’s Food cake mix, vegetable oil, and eggs to a large mixing bowl. Mix by hand or on medium-low speed until combined and a dough forms. Using a spoon or dough scoop, shape the dough into 1-inch balls by rolling the dough between your hands. Next, roll each ball in the powdered sugar, generously covering, and then place the dough ball onto a lined baking sheet. Bake for 8-10 minutes. Remove from oven and let them cool for a few minutes before transferring to a cooling rack. Continue until all dough is cooked and then set aside while you make the frosting. In a large stand mixer bowl, beat the egg whites and salt at high speed with the whisk attachment until they become foamy. Next, slowly add in the sugar and continue beating until stiff peaks form – about 15 minutes. After the egg whites are ready, let them sit while you prepare the corn syrup. In a small saucepan, heat the corn syrup on medium-low heat until boiling. As soon as it starts to boil, remove from heat. Turn the mixer back on to high speed and slowly pour in the boiling corn syrup. Add in the vanilla and continue beating until the mixture becomes thick like frosting. To assemble the hot cocoa sandwich cookies, spread a thick layer of the marshmallow frosting on the bottom of one cookie. Add another cookie on top, creating a sandwich cookie. 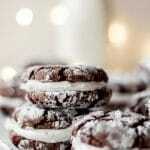 If you love these hot cocoa sandwich cookies, be sure to check out these other cookie recipes! Just wow! These are my dream cookies! You had me at marshmellow but then I saw all the photos!! Definitely pinning this!